Avoid confusion and save time by watching this brief orientation video. You'll learn where things are located and how to get started. Look in this section for important messages every time you log in. Let's get started by watching this video. Start your family history Story Blog to write your stories one at a time. Use our story prompts to elicit memories in all life stages, milestones, and wisdom, etc. Share your stories with only family or promote your blog in our public library. Print your legacy stories in an heirloom Legacy Book. Backup, organize and share your highest priority legacy photos by creating Legacy Slide Shows. Share your slide shows with family or contribute to our public library for research and enrichment. Create heirloom Legacy Photo Books by using our easy templates. 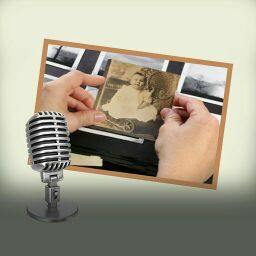 Our free mobile app records your oral history in pictures, capturing your dialect, personality, attitude. Upload, organize and share recordings with family or contribute to our public library. Convert recordings to video to preserve on personalized heirloom thumb drives. Copyright © 2008-2019 LegacyStories. All Rights Reserved. LegacyStories.org offers personal history tools, training, archiving and sharing features to help people pass down to heirs their life lessons, values and traditions.